Summon: Give a creature Lethal. 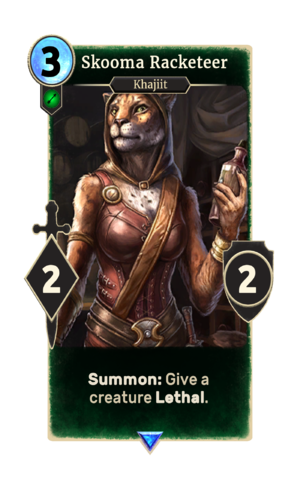 Skooma Racketeer is a rare Agility creature card. It is part of the Core Set. In addition to the card's availability in the Core Set, two copies are included in the Black Marsh Smugglers deck, two copies in the Paarthurnax's Roar theme deck, and one copy in the Hlaalu Schemes theme deck. "This one offers something tasty." "My strength comes from skooma!" This card's summon ability applies the Tainted Skooma card effect. This page was last modified on 15 February 2019, at 14:05.